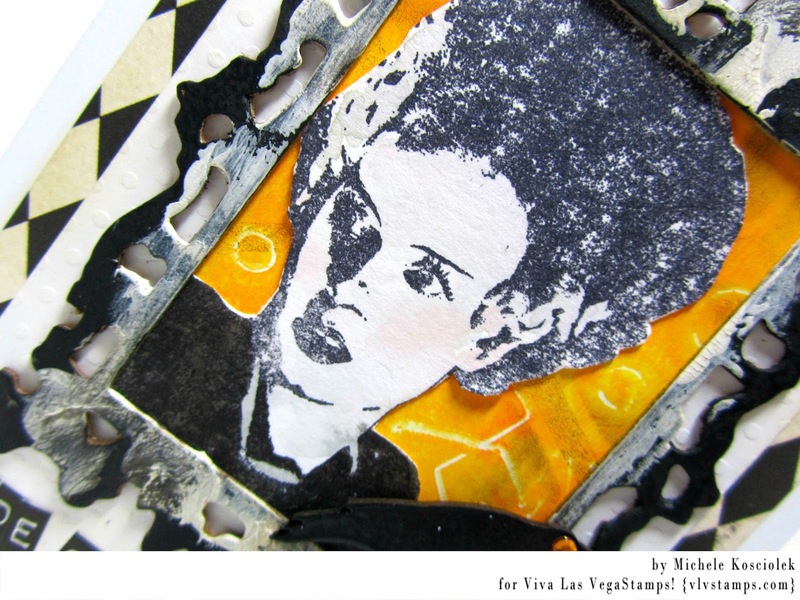 We are hopping over at Viva Las VegaStamps! and our theme is famous monsters, fun right?!! Here is our awesome line up! 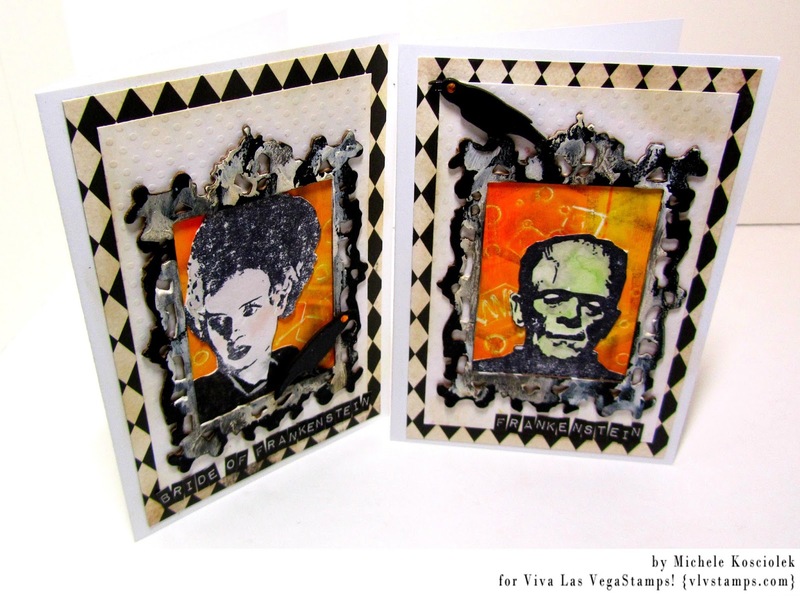 I created a card duo to share with you featuring the Frankenstein's. I used Frankenstein's Bolts and Bride of Frankenstein for these cards. 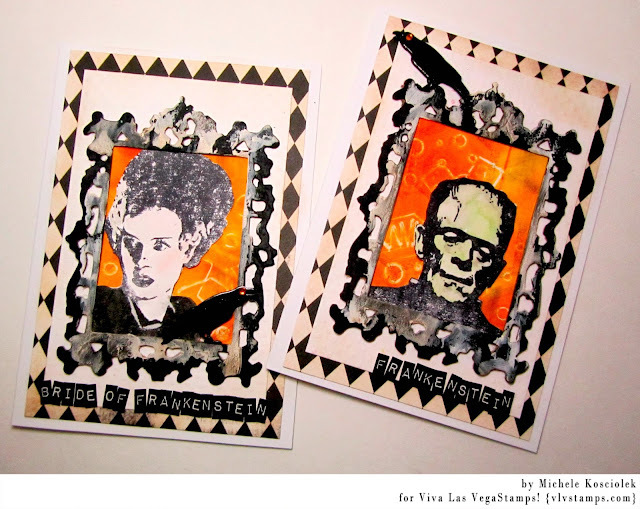 Monsters are stamped in archival ink and colored with Distress Markers. The frames are cut from chipboard with a Tim Holtz die, painted black with accents of white crackle paint and some Distress Ink. 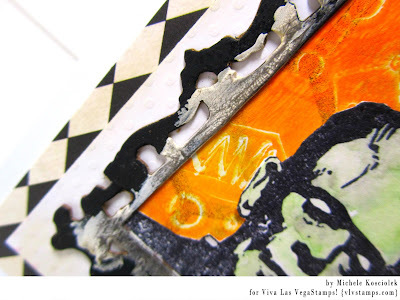 Finishing touches are Um Wow Studios chipboard ravens, Bazzill and Authentique papers and some Tim Holtz alphas. I just love Halloween for creating!! Bright colors and grunge together, it doesn't get any better than that. Make sure to get to all the design team members blogs and see what they have up their sleeves, then back to VLVS! and let us know your favorite thing about Halloween. Leave some love too, because there will be a prize up for grabs!! Labels: archival ink, Authentique, Bazzill, Distress Markers, distress paint, Famous Monsters, Um Wow Studio, Viva Las VegaStamps!, VLVS! The umWow chippies are a great addition to these babies. They look fantastic! These are such fun cards. I like the layers. CArds are very cool. love the backgrounds. Boo-tiful! I love the die cut frames and all your techniques. The frames and raven chippies really add a great finishing touch! These look fantastic! The harlequin design frames them so nicely! These images really pop. Love the diamond background! What an awesome pair! I love the use of the orange, really makes the images pop! And those ravens - love! These are so awesome! Great colors and layers!! Showcased perfectly! Orange is my favorite color so I really couldn't love these more. Great job! Brilliant job and brilliant colours! Love how you framed them, great family portraits. 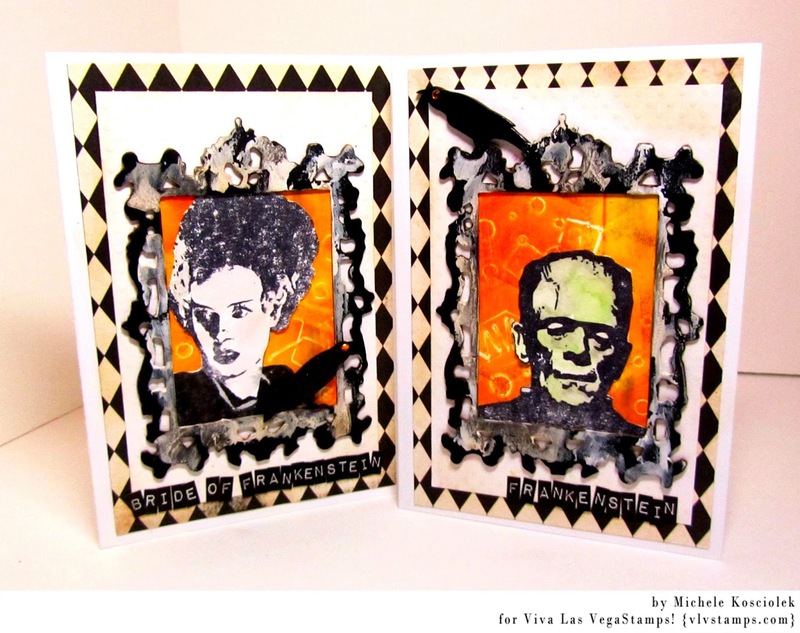 These are great - love the texture! 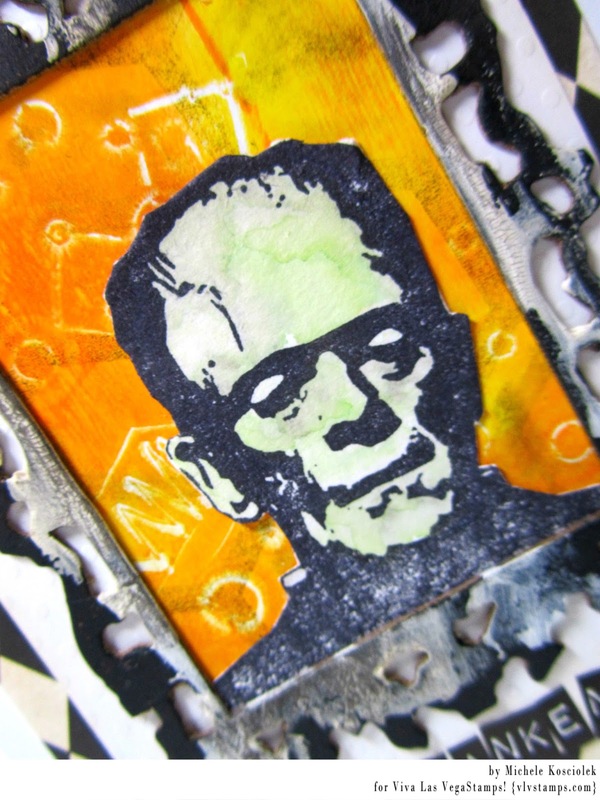 Frankenstein looks like his listening some music :) Good work! Love this Duo, love the frames and colors. Great work! love the black and white with the pop of color!